Yes, you read that headline correctly. Last week I was at Sparrow Market, my local store, and I noticed a new addition in the cooler: Shinola Cola. Yes, as in the watch, bicycle, and home goods store that's aggressively dominated Detroit hipsterdom in the past few years, despite its less than authentic origins. 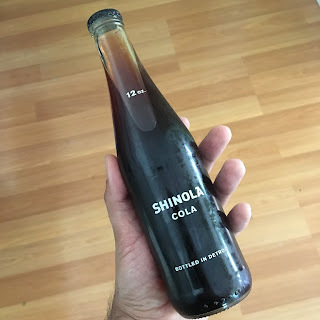 A bit of digging led me to learn that Shinola Cola isn't new, but it was the first time I'd seen it. As a fan of weird novelty drinks (OK Soda and Fruitopia chief among them), I had to try it. But I was also skeptical as to its quality, so I grabbed a bottle of Mexican Coca-Cola (you know, the one that allegedly is made with real sugar) to do a taste test. I am nothing if not scientific. I took two glasses and labeled one as S and one as C. Then, I filled each, moved them around a few times so I wouldn't remember which was which, left the room briefly, and came back to try in order to truly forget which was which. I preferred the first glass to the second, in part because the first had a more caramel flavor as compared to the astringency of the second. The second glass almost reminded me of Pepsi (though it's been years since I've had a Pepsi). Upon reveal, it turned out that the first was the Coke, and the second Shinola. So while I'll be sticking with the pause that refreshes, I do admit that, like many of its sister products, the Shinola Cola bottle looks great — even if its quality didn't measure up. Like a lot of their products, all packaging, little substance.